NewsAlert from Dan Hassin is an RSS application with a whole lot going on, but its saving grace is that all of these things are customizable with a little time and energy. Nose for News: You tell NewsAlert what areas you’re interested in, and the app will send push notifications whenever a new story related to your keywords appears. The initial setup for NewsAlert is deceptively easy: tap the plus button, add a few keywords, and let the app do the rest. If you pick hot topics like “health care” and “Tiger Woods,” your iPhone or iPod touch should be vibrating uncontrollably within minutes. The app sends push notifications to alert you to new stories in your areas of interest, which can really start to add up. To abate the onslaught, NewsAlert comes with plenty of setting tweaks to control when and how many alerts are sent to you. The most useful of these is the “Blacklist source” option. NewsAlert will send push notifications for every publication from the New York Times to the Kansas City Star. While you may pick up a new favorite news source without any filtering, it’s not likely that you’ll want to read every last publication in America running stories on health care reform. Trust me, there are a lot. It might have been useful had the developer taken the reverse approach, allowing users to build their own stable of sources rather than giving them everything at the start and letting them pare it down. But the blacklisting technique does come in handy. Now that you’ve chosen your keywords and narrowed down which publications you want to read, there’s the pesky prospect of round-the-clock news alerts. Most of us just aren’t that devoted to anything at 4 a.m. So you can tailor the hours of the day that you receive notifications and set a maximum number of alerts to receive in a day as well. This feature is an absolute necessity, because it’s enough to warn me two or three times that President Obama has just held a press conference—I know that every media outlet in America is covering it, and I’ll read it later. The news search can also be set to only include headlines, so you’ll just get alerts for stories about the president, instead of every last story that mentions him. And if you’re just not getting enough news with 10 keywords, there’s an in-app option to buy more. If you’re concerned that your friends and family aren’t getting all of their daily news, you can e-mail or tweet articles with reckless abandon. NewsAlert is powerful enough to make you perhaps the most well-informed person on the planet, but it’s unlikely that you’ll want to read 20 articles a day on the same topic, unless you’re a Washington lobbyist or just really obsessed with Justin Bieber. 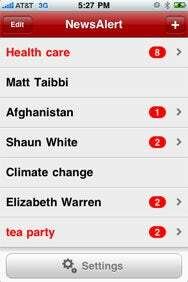 Still, for $3, NewsAlert provides a unique and meticulous news experience in the palm of your hand.